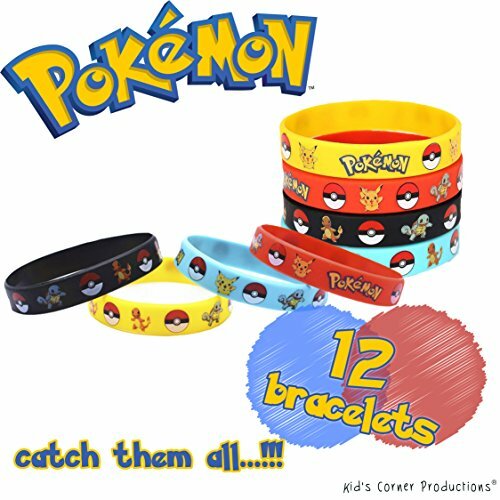 THE BEST POKEMON PARTY FAVOR: Bring fun and excitement to your party with the Kid\'s Corner Productions Pokemon rubber wristbands. 12 or 24 bracelets in variety of colors namely yellow, orange, blue, and black. Choose yours. * PRODUCT SPECS: Laser printed with Poke Balls, Pikachu, Charmander, and Squirtle in amazing bright colored bracelets that\'s one sure eye-catcher for everybody. * SIZE: Made of silicone rubber with superior stretch ability that will fit older children and adults. Designed for both girls and boys. * TOTALLY SAFE TO USE: Superior quality non-toxic rubber material that\'s absolutely safe for daily wear. With hypoallergenic properties so kids with the most sensitive skin can wear this with confidence. Non-staining and has properties that resist color-fading. * PERFECT AS PARTY FAVORS: A perfect give away for all ages in just about any celebration. Add this up to party favors or party toy bags, Easter eggs or even a Pokemon Piñata for a great surprise. Make sure to collect them all!